Eugenie Bouchard suffered her worst defeat of the season recently, but she doesn’t seem to be bogged down one bit. The Canadian tennis star, a former world No. 5 and Wimbledon runner-up, suffered a shock 5-7 6-3 6-4 defeat at the hands of American Madison Brengle in the first round of qualifying at the Qatar Total Open in Doha over the weekend. 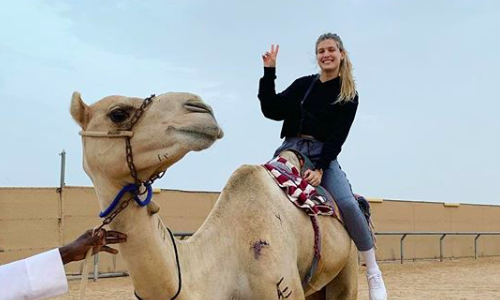 Bouchard, however, appeared in high spirits as she enjoyed a camel ride along with her entourage on Monday. The 24-year-old later took to her official Instagram account to share some glimpses with her 1.9 million followers. He’s posing for the camera too ??? ?